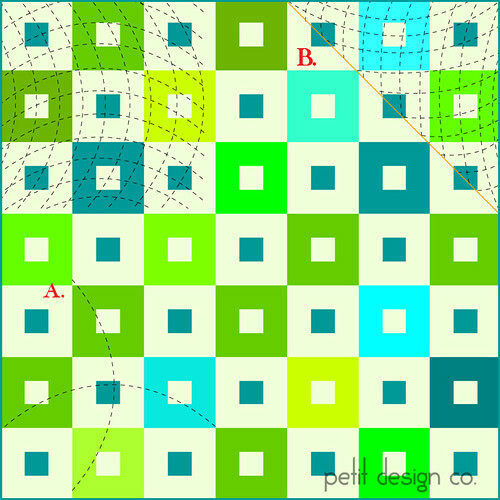 Since we already covered grids, today’s design shouldn’t be too difficult for you. Despite the fancy name it is basically a curved grid. You can achieve this design by first marking 2 curves for the cross hairs as shown in “Fig. A” You can use anything round to mark these lines. Look around your house for round objects like plates, cups, the bottom of a pitcher, the base of a lamp etc. The next step would be to follow your first line of stitching with the edge of your walking foot or your walking foot guide bar. Do this until you fill in the space you desire. While I don’t think I would use this design as an “allover” design it is a really pretty design when used in setting blocks and corners (Fig. B) Stitching this design is no harder than stitching out a grid. I’ll make sure to show you a quilt on Sunday that incorporates this design. I know this quilt is not the best example, but what do you think of using this design? I like this design, I also liked yesterday's continuous curves.